Northern Masked Chafers (Cyclocephala borealis) and Japanese Beetles (Popillia japonica) are on the wing in southern Ohio. These scarab beetles (family Scarabaeidae) are two of the three most common "white grub producing" beetles found beneath turfgrass in Ohio. The third potential participant in the grub-party are Southern Masked Chafers (C. lurida) which have not yet appeared on the scene. The chafers are often overlooked because they are night flyers and the adults typically produce little to no plant feeding damage. Their most notable claim to fame is their bumbling buzz-bombing of porch lights at night with the southern chafers appearing at dusk and the northern chafers around midnight. Their light-harassing behavior may cause them to be lumped in with May-June beetles which were on the wing about a month ago. Aside from flight times, you can also identify the masked chafers the same way you identify their grubs; by looking at their rear ends (in the privacy of your own home). Northern masked chafers have hairs that are easy to see at the end their abdomens as well as along the sides of their abdomens and elytra (wing covers). The sparse hairs on southern masked chafers are very short and difficult to see without magnification. The "out of sight, out of mind" feeding behavior of chafer larvae (white grubs) also keeps chafers below our radar. It is common for people to assume that white grubs found beneath turfgrass in Ohio are Japanese beetle larvae. However, for a number of years the most common turfgrass white grub has been chafer larvae. In general, Japanese beetle numbers have been on the downswing in much of Ohio with the chafers on the upswing. The trend with Japanese beetles may have reversed last season with some highly localized heavy populations observed in some parts of the state. But, it's still too early to determine if this represents a beetle "comeback." One thing is clear. Despite a general lack of Japanese beetle adults, damage to turfgrass from white grubs continued to be reported along with the accompanying excavation damage from skunks and raccoons in search of grub meat. Of course, the grubs that have been most responsible for damaging turfgrass and drawing animal raiding parties were the larvae of masked chafers. Southern and northern masked chafers are native beetles. 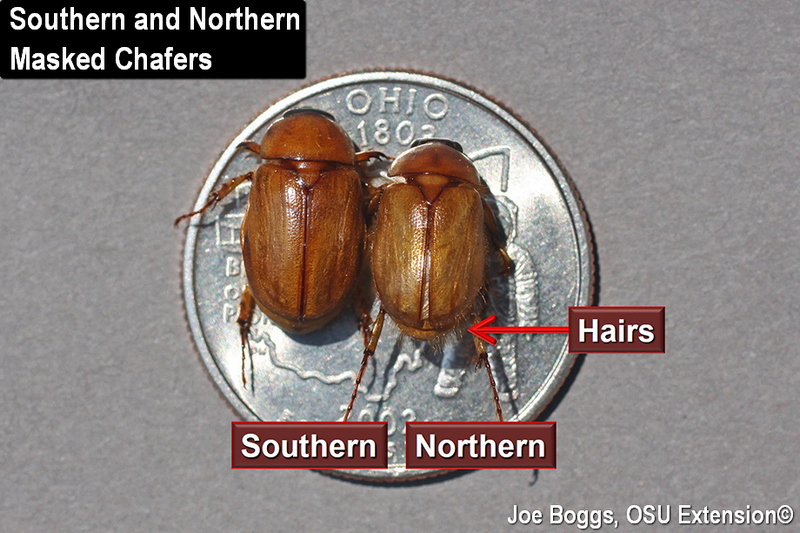 As their name implies, the southern chafers are most common in the southern U.S. including southern Ohio. Their grubs may be found beneath warm season grasses such as Bermuda grass as well as cool season grasses such as Kentucky bluegrass. Northern masked chafers have a taste for cool season grasses and are found throughout Ohio as well as several U.S. states ranging from New England to Nebraska. The grubs of both of masked chafers may also be found feeding on field crops including corn, oats, and wheat. I'm already being asked if this is going to be "a bad grub season." At this point, there is simply no way to make that prediction. In fact, I contend "grub predictions" are about as accurate as predictions of fall color, Triple Crown winners, and where LeBron James will play basketball. There are simply too many factors in play that can wreck the predicted outcome such as LeBron Jr.; will he skip the eighth grade to play in the NBA? Masked chafers and Japanese beetles lay dehydrated eggs that must absorb water from the soil in order to develop, so wet mid-summer soil conditions support a greater egg hatch which could mean more white grubs. We did have some spotty wet weather last summer; however, high soil moisture was not experienced everywhere in Ohio. White grubs must also run a gauntlet of pathogens, predators, and parasitoids. Survival to pupation is not a sure-fired proposition even if egg hatch was highly successful. Unfortunately, it remains a wait-and-see proposition for turfgrass managers starting with paying close attention to reports from customers of high numbers of Japanese beetle adults feeding on foliage and nuisance numbers of small brown beetles (masked chafers) flying to their porch lights over the next few weeks. Keep in mind that these reports can be highly localized; customers located only a few miles away may experience radically different beetle populations. It's also important to take into account nearby farm fields relative to nighttime chafer visits to porch lights. This is not a one-size-fits-all proposition which makes grub predictions at best just an educated guess. However, hope spring eternal. LeBron may stay in Cleveland; LeBron Jr. may stay in school; the Cleveland Cavaliers may again make it to the playoffs next year; and the Reds may win a few more games. Of course, I picked Mendelssohn to win the Kentucky Derby; he came in last.